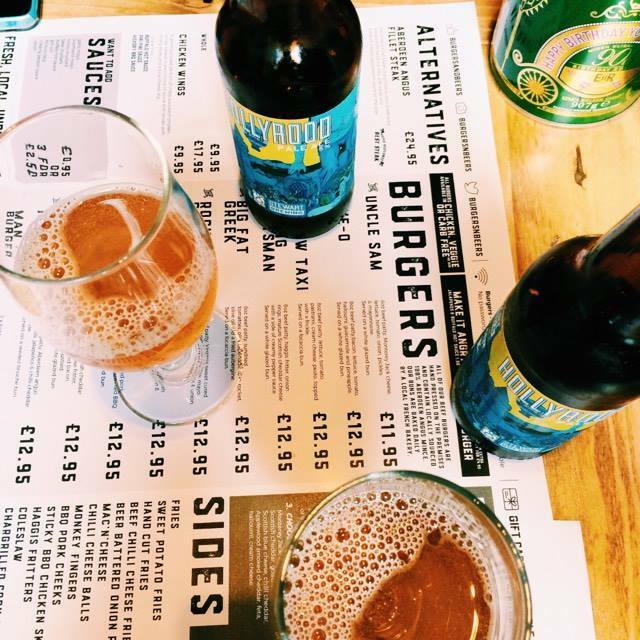 What better meal is there than the classic combo of a burger and a beer? Its an all time favourite of Brits, making it one of the most popular meals out there. 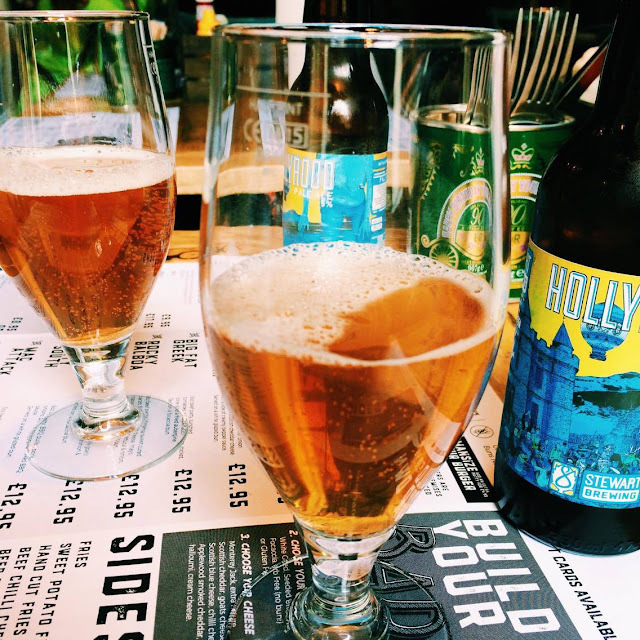 So when a place is prides itself on its burgers and beers - that its literally called Burgers and Beers – you know you’re in for a good meal. The kind folk at Burgers and Beers Grillhouse – specifically Amy – extended an invite to me to try out their new menu and I jumped at the chance so fast. 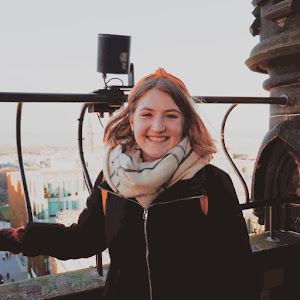 Burgers and Beers is located on the Royal Mile, a perfect spot for any tourists who are exploring the historic high street, as well as any students who can pop along from campus. The interior is funky, with plush benches and exposed wood and pipes. 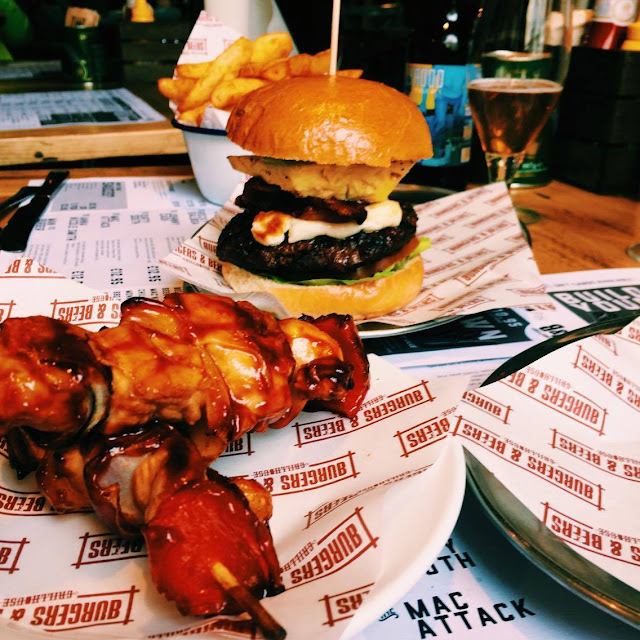 The menu is filled with choices, for the beef eaters, chicken lovers and vegetarians alike – any of the burgers can be chosen for each of the delicious options. 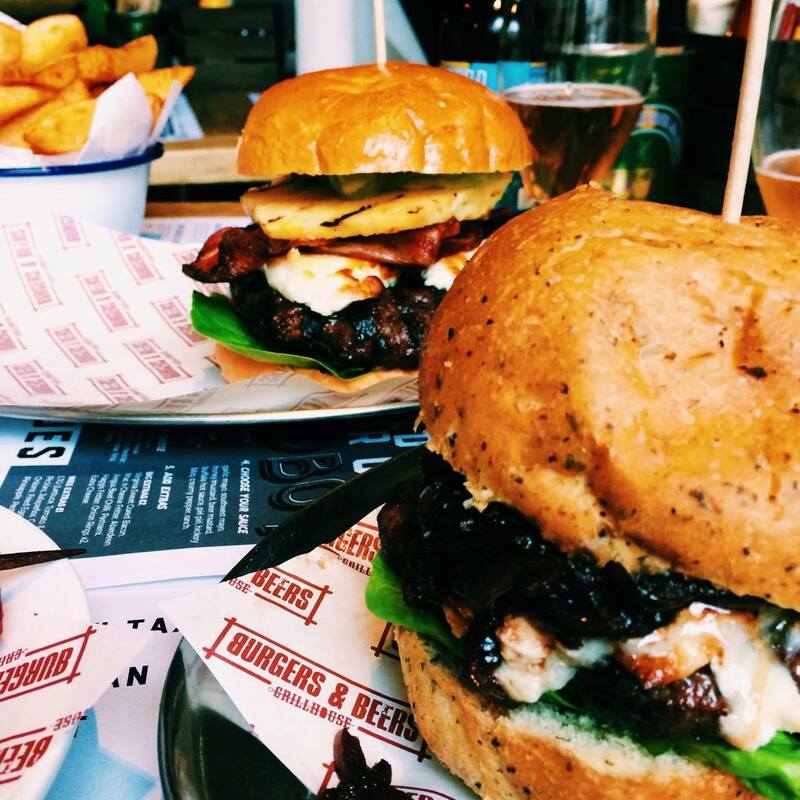 All the meet is sourced locally from the Edinburgh region – which Amy explained to us before we browsed the menu – so you know exactly what they’re putting into their handmade burger and you know its quality. Each beef burger is filled with 100% Aberdeen Angus and hand made into your pick. 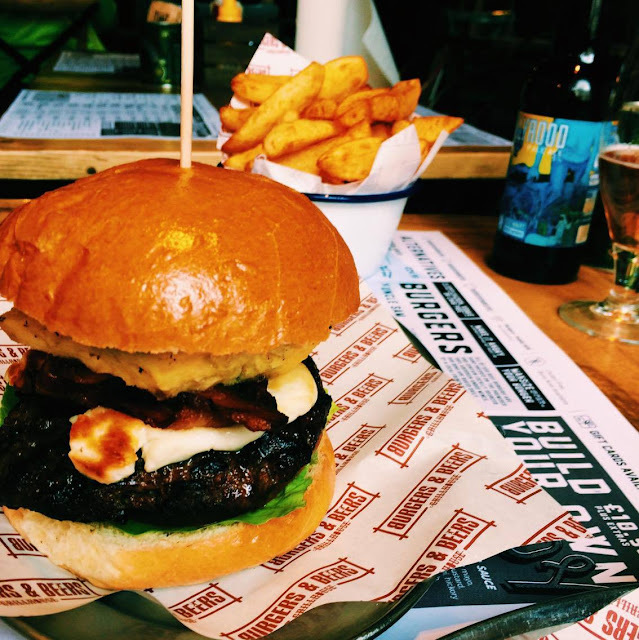 While Eleanor chose the 5-0 – a beef burger with bacon, lettuce, tomato, halloumi, pineapple and guacamole. The burgers were both perfect – juicy and delicious and both filled to the brim, making it hard to eat it gracefully (but I suppose burgers aren’t supposed to be an attractive thing to eat when they’re this good). We had our pick of sides too – and found it difficult to choose from all the options they had. While there’s the classic sides of fries, chips and sweet potato fries, they also have some more unusual sides, like monkey fingers served with hot sauce and blue cheese dip. 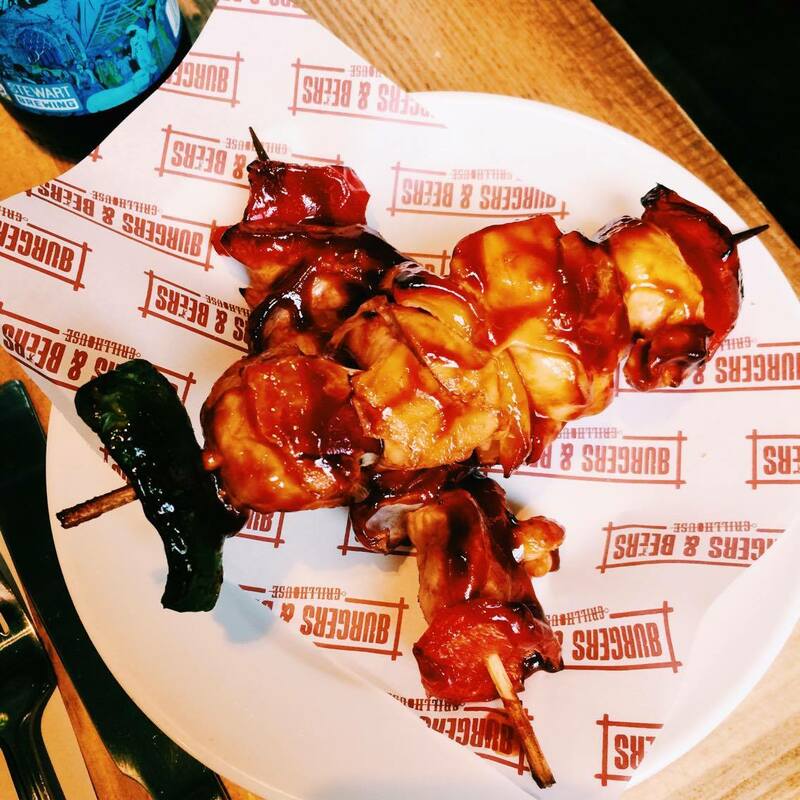 We ended up picking Sticky BBQ Chicken Skewers and a more classic side of hand cut fries. The fries were chunky and the perfect accompaniment to the burgers. The chicken skewers were so tasty - and another meal in itself. We were sharing - family style eh? - so had one skewer each, which was the perfect amount. They were covered in a gorgeous bbq glaze and great to nibble on between burger bites. To wash down the burgers, we had a beer each. As you can guess by the name, they have so many beers on offer. We went for a pale ale, and followed the recommendation of the staff as it was a ‘staff pick’ – Holly Rood Beer. A local beer that was the perfect addition to our meal. I booked our table for lunch, meaning the place was quite quiet so we had plenty of room to sprawl our shopping bags around us. However, I've visited Burgers and Beers before at dinner time, and although its busy with people, it not too full or loud. It has the perfect relaxed atmosphere to enjoy some good food. The staff were the real highlight of our trip - Amy greeted us as soon as we walked in, and throughout the meal we were regularly checked upon. The menu was explained perfectly, and everyone was eager to answer any questions we had. We didn't even have to wait long for our food to come out - everything was speedy, without feeling too rushed. 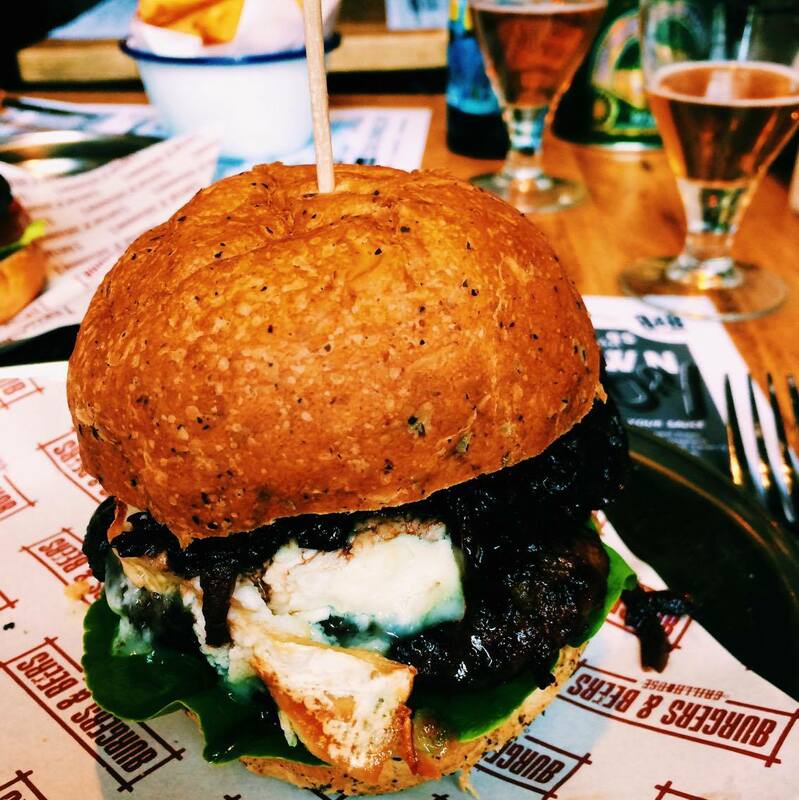 So if you're in Edinburgh and looking for somewhere to get a good meal that will leave you filled for the rest of the day / night, then Burgers and Beers Grillhouse should be top of your list! Especially if you're coming to visit Edinburgh - then you have to have a taste of the locally sourced burgers on offer here! Have a look of their menu here and be sure to book in a table - being such a popular jaunt booking is recommended! Have you visited before? What burger would you order if you were to visit? * This is a sponsored post, however all opinions are my own. Those burgers look amazing! I love a good burger. Heading to Edinburgh in July so might have to check this place out! Oh my god this place is insane!!! I love burgers and this made me so hungry. Going to check out if there are any places like this in Sydney!! The burgers look amazing! Will have to head here when I get the chance! How delicious. We actually have a restaurant Here called burgers and beers! I'm on a diet with healthy juices and just seeing this appetizing combo and the glass of beer make me suffer a loooot. I'm jocking, I'd love to have them both, but after losing at least 10 pounds. Seems like the perfect place to eat burgers and these kind of foods. I try to eat a bit healthier now with the pregnancy.